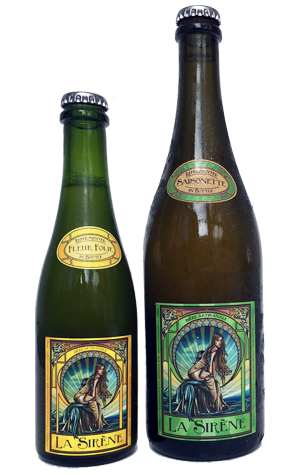 Not new beers here, more the latest evolution of a couple of La Sirène seasonal releases out in time for summer. The Saisonette is the brewery's lowest ABV saison variant, one brewer Costa Nikias suggests may be most like the original farmhouse beers of the style of all in his broad array. It's a suggestion with added weight now the beer is brewed with the latest iteration of the La Sirène house yeast, containing, as it does, a mix of cultures, including those native to the brewery and its surrounds. Aroma wise, there's little hint that it's sub-4 percent ABV, with a mix of citrus zest, spice and soft malt sweetness at play; it's on the palate its "session saison" qualities become more apparent: light and lively initially, then dry to finish. While the evolution of the Saisonette is down to the development of the house yeast, this year's Fleur Folie – the brewery's honey saison – has undergone more changes. For the 2017 brew, the honey comes from Archibald Honey, a local producer that's been in the game nearly 60 years and whose setup Costa reckons is more in keeping with the "urban farmhouse" stylings of La Sirène. He tasted a few varieties with the owners who then produced a blend to add during fermentation. The result is a beer with a, dare we say it, glowing golden honey colour that leads off with floral, sweet honey and musty, "of the land" aromas. It's light-bodied, with the flavours of the honey clearly apparent, before the yeast's tart, drying qualities bring things to a close. "Sunshine in a bottle," according to Costa.